European Humanities University in Vilnius launches the Enrolling Campaign to recruit students for undergraduate and master’s programs. 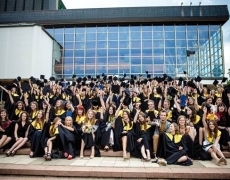 EHU provides educational grants and scholarships of up to 2,000 euro per year for citizens and permanent residents of Belarus for admission to Bachelor and Master courses. On-line applications for full-time undergraduate program can be submitted from April 1 till June 19, 2014, for distance undergraduate programs – from March 3 till July 4, 2014, and for Master’s programs – from April 1 till July 11, 2014. If you have questions about the enrollment procedure, please contact us: recruitment @ ehu.lt or Skype: QuestionEHU.